I currently have a 2013 Honda Civic EX with 107,000 miles. Looking for something with more cargo room to haul camping supplies on road trips. 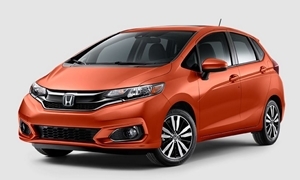 I would look into a Honda Fit. It provides a lot of room and is reliable while maintaining small exterior dimensions. Any year is reliable, but 2015 and newer Fits were nicer because of a redesign. Another possible candidate is the Kia Soul. You can get a newer one with more features than the Fit because Kias depreciate a lot. 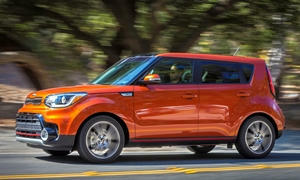 Perhaps a Kia dealer will have a CPO Soul in your budget. If so, you'll get a 10 yr 100k mile powertrain warranty. The Soul provides a lot of space like the Soul but feels more substantial and it was available with more features than the Fit. I suggest a 2014 or newer, but any year is reliable. 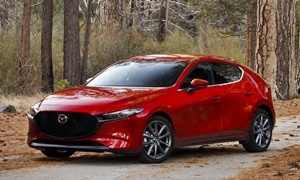 The Mazda3 Hatchback handles well, is reliable, and you can fit a surprising amount of stuff in the trunk despite having a tight interior. Look for 2012 or newer ones. Since you need space, I would avoid sedans. Hatchbacks and wagons have the best ratio of more interior space and smaller exterior. SUVs often provide more space than hatchbacks, but they are much larger on the exterior. For example, a Mazda CX-5 may have 20% more interior space than the Mazda3, but it may be 40% bigger. Just something to think about if you want something that handles well or is easy to park. 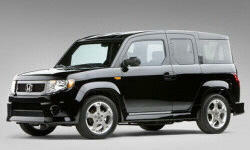 Look for a used Honda Element. You get the reliability of a Civic, while cargo space far exceedes a CRV. Great camping vehicle. Floor is rubber and easily cleaned. Back seats can fold flat against the sidewalls leaving a flat floor you can sleep on. Very flexible interior. I like the responses both Lectrofuel and Dnslater gave. 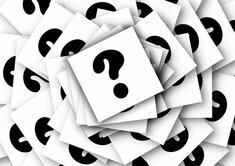 Your old car has 12.5 cubic feet of capacity. I am a little surprised neither recommended a 2013 Toyota Prius. There is one near me costing $10,300 with only 63,000 miles on it which is only $300 over your price limit. This will make it up in gas mileage quite quickly. It has a capacity using all the seats for passengers of 21.6 cubic feet, a lot more than your old Civic. Not sure if you are interested in a hybrid, but that is an option as well. As I said, you won't go wrong with the above choices either. The Element and Prius are great choices. My friend has an Element he uses to load surfboards in and camp in. He also has a Soul EV. They are great underrated cars. My two Prii have a lot of space especially with the seats down. Two Costco trips worth of stuff can fit in the back and it still seats 5. Unlike a lot of cars, much of the space is usable. All of this while getting over 50 MPG. If you haul tall things, think about visibility out the rear windshield. The Element and Soul will allow you to stack taller things without blocking the window. Man, those other guys are good; I can hardly get a word in edgewise! You've gotten great advice. I'm a big fan of the Soul & Fit because of their great utility, reliablity and kinda fun to drive factors. The Vibe Matrix twins are also great, but it getting body or interior parts for the Matrix may be a bit tricky given it was discontinued a number of years before the Matrix. Now you figure you what you look best in and go dealin'; let the fun begin! Kia Soul much more upscale than the Honda Fit & civics. Fit was underpowere and just a cheap economy car - I did test drive the top of the line...just cheap interior, uncomfortable back seats. . Soul! was quieter, smoother and better quality than the Mini Countryman and othe small cars I looked at. Was impressed with the quality. No problems with the 2014 and I do hard driving, lots of trips 2-5 miles. 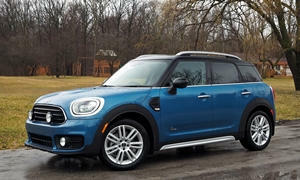 Doesn't have the badge Mini has but none of the squeaks or rattles the Mini is so well know for (maybe due to the harse ride that loosens everything up in the Mini). Like the Hyundai Tucson, felt like a luxery SUV compareed to Rav4 and CRV. Interior seemed nicer, maybe not as nice as the Soul.